The theme for this month's Mixology Monday (MxMo LXXX) was picked by Nick of The Straight Up blog. The theme he chose was "Anise," and he elaborated on the theme with his description of, "While I had a few ideas I've been kicking around for this months theme, ...I ultimately decided on one of my favorite flavors: anise. Although great any time of year, there is something about colder weather and the holidays that really sets my anise fetish into overdrive. While past MxMos have seen a few specific sources of anise, such as pastis and absinthe, I wanted to open things up to anything anise flavored, the more unique the better. Most folks have something with anise notes laying around, whether it's absinthe or pastis, ouzo, Genepe, even Green Chartreuse, Peychaud's, Raki, etc. Maybe get creative and make something tasty with some star anise, like a syrup, infusion or tincture. 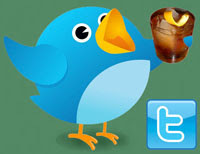 Show us that riff on a Sazerac or Improved Holland Gin Cocktail that you love, or create something entirely new." I originally wanted to do a drink that used Peychaud's Bitters as a base spirit, but there were few save for the Gunshop Fizz that came to mind that I had not tried yet. And I did think of recreating a Sazerac in Tom & Jerry format, but I recalled that I had already written about the Sazerac Toddy. 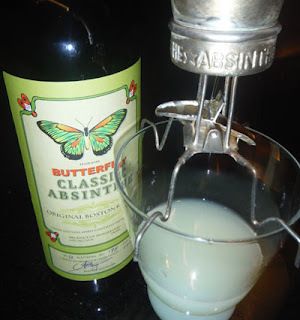 Next, my mind drifted over to the bottle of Butterfly Absinthe that had been sent to me and I considered doing an Absinthe Suissese, but I got bogged down over picking the right recipe as to whether it had crème de menthe, orgeat, cream, egg white, orange blossom water, or other. The earliest recipe I found was in Maloney's 1900 The Twentieth-Century Cocktail Guide for Mixing Fancy Drinks but it was just absinthe, orgeat, and egg white. With such a minimalist recipe, I decided to take a step further back and go with an Absinthe Drip. Over the course of a few events through the last 14 months or so that have included a pre-Boston Cocktail Summit Origin Spirits tasting event, Whiskey Live, and Boston Thirst, I have had the honor of meeting the people behind Butterfly Absinthe. The spirit is a recreation of 1902 Boston recipe that benefits today from the elegance of modern day Swiss absinthe producers. The ingredients list are historically the same with wormwood, hyssop, melissa, peppermint, anise, star anise, fennel, and citrus, but no sample of the original of the early 20th century product has turned up to confirm the flavor profile. I was quite pleased when they decided to send me a sample of the absinthe for review and delighted when they also included a pair of absinthe glasses as well (one pictured above). The glasses have a mark for an ounce and a half pour of absinthe and I was able to determine where the 4:1 and 5:1 dilution marks would lay. While we do not own a fancy absinthe fountain, Andrea did purchase a rather mesmerizing absinthe balancier years ago -- a similar one tick-tocking away can be seen here in action on Youtube. Since most modern quality absinthes do not require any sweetener, I skipped the sugar cube and instead filled the balancier with crushed ice. I added ice water until the desired 4:1 dilution was reached in the glass. Slowly add ice water to the absinthe in a glass. With the 4:1 dilution, the 130 proof spirit was decreased to 13% ABV, the approximate strength of many wines, and it gained a beautiful louche. Our tasting notes included anise, fennel, licorice, mint, lemon, and wormwood, and the low proof and clean spirit was definitely gentle enough to drink even without sugar added. With the sugar, the drip would be the simplest of classic cocktails for the spirit, bitters, and water are already in the mix. Thanks to Nick for hosting this month's spiced event, and cheers to all the rest of the Mixology Mondayers for keeping the lifeblood flowing!